These corms flower in the autumn well before the leaves appear in the spring. The foliage is quite coarse and relatively large and needs to be hidden if possible. I used to grow my colchiums at the base of a hedge to hide the leaves. The lovely flowers appear in soft purple or white and can be single or double all are worth growing. They will grow very happily in grass, especially damp meadows, but it does mean you cannot mow the grass between late August when the flowers start to appear and June the next year when the foliage has died back. You can grow a corm on the window sill on a saucer with a small quantity of water and it will flower, but you need to plant it as soon as the flowering finishes to help bulk up the corm, and it still may not flower again the next year. In the garden the corms appreciate deep rich soil that is well drained but does not dry out, as they are found naturally in the Caucusus’. The need full sun to flower well and hold themselves upright, in too much shade the flowers fall over. The plants are a rich source of the drug colchicine which is used to create mutations during cell division (mitosis), and was once used in the treatment of gout. Furthermore, they are not the true autumn crocus that is Crocus speciosus – a member of the Iridaceae family, not the Colchicaceae family. 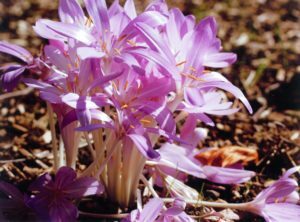 Colchicum autumale and Colchicum speciosum ‘Album’ – (also known as ‘Naked Ladies’ and ‘Autumn Crocus’) can be found on the Azalea Bank and Wilson Walk.